When you race at one of our facilities, you may notice something on your race results printout called ProSkill. We get a lot of questions about what ProSkill is and what it means. Here is everything you need to know about your ProSkill score including how it can lead to an extra $10,000 in your pocket (Hint: you have to read all the way to the end to find out)! 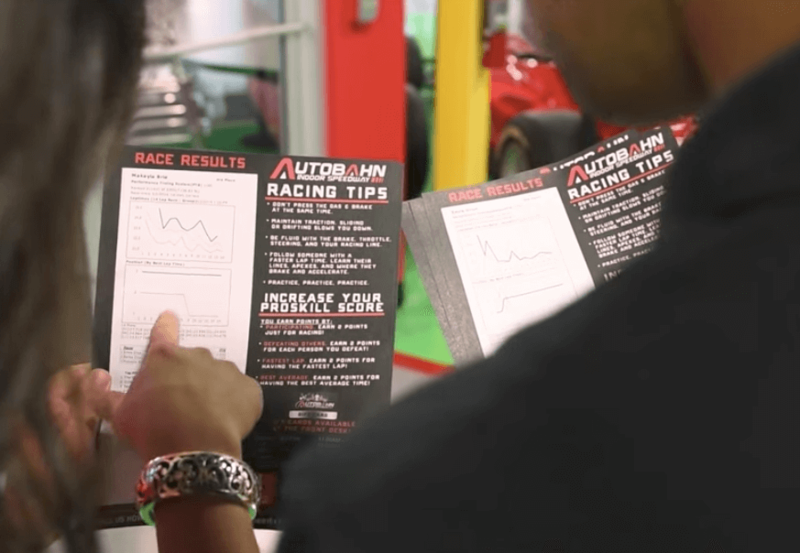 Points systems are used in many forms of professional auto racing to determine the ranking of the drivers throughout the race season — NASCAR, Formula One, IndyCar, and many others all use points systems. Everyone starts out the racing season with the same number of points. The champion of the racing series is the one with the most points at the end of the season. ProSkill is based on the same concept, but it is applied to a year-long season of Arrive and Drive kart racing (see below on when the season officially begins). It’s the points system that we use to rank racers at all our facilities across the country. It allows racers to compete for best ProSkill on a location by location basis, but also on a nationwide basis. Also, just like in professional racing, everyone starts off the season with the same number of points. We reset ProSkill annually at the beginning of the American E-Kart Championship league season in August. All racers start the season with 1,200 ProSkill points. One of the easiest ways to increase your ProSkill score is by racing more often. This is because each racer receives 5 points just for participating in a race. The only way to improve your race craft is to get out there and race on a regular basis, and this encourages you to do exactly that. One of the easiest ways to increase your ProSkill score is by racing more often. However, the way to really boost your ProSkill score is by beating other racers that have a high ProSkill score. ProSkill is a weighted system, meaning each time you race, you are scored against the racer with the best lap time. The number of points you win or lose is based on the ProSkill score of the other drivers. For example, if I have a very high ProSkill and you had a low ProSkill, I would be expected to be able to beat you in a race. If I beat you, I would be awarded a small number of your ProSkill points. However, if you pull off an upset and beat me, you might be award 100 or more of my much larger number of ProSkill points. In a full heat of ten racers, there is a lot of sophisticated math that goes on to determine how many points each racer wins and loses. In most cases, about half of the racers will gain ProSkill points, and half will lose points. For this race, the ProSkill math was very easy because each racer started the heat with an equal amount of ProSkill points. However, if these same racers also raced each other in the second heat of the year, the calculations get much more complex. So we let our high-tech timing and scoring system handle those calculations. We all love a little competition. For most of us, our competitive drive is strong and we want to get better and better every time we race, whether we’re competing against our friends or our own best time. If that’s not enough, at the end of the year, we will be adding even more incentive for you to increase your ProSkill score. We’ll be awarding special prizes to the top ProSkill ranked racers at the end of the year. We’ll even crown a ProSkill champion at each location, as well as a champion of champions — the winner of the top ProSkill score in the country! Finally, the top two ProSkill Champs from each location will receive a free “wild card” entry in the local American E-Kart Championship (AEKC) playoff giving them the opportunity to compete for the $10,000 first prize in the American E-Kart Championship final round in Chicago in mid September. Check your ProSkill and see how you measure up against the competition here.